Everyone that knows me from my family and closest friends…I LOVE EVERYTHING! I am definitely a very passionate person. I was told many times that I see things with child like wonderment. I gasp A LOT and maybe could be a little bit dramatic with the way I react toward things. Whether it is people that I love, animals, interior design, architecture, nature, fashion, make-up, movies, music…I think that covers almost everything! I have been called many times a Free Spirit. So I decided to own several businesses that I am passionate about. I truly believe nothing is impossible. I have a Global Beauty & Wellness business where I am able to travel the world with my husband and daughter, an Interior & Lifestyle Design Company based in Los Angeles that I own with my best friend, and an Entertainment Company. Why not do it all! We only live once and tomorrow is never promised. Even though life has brought some major obstacles to test my strength. Especially last year, when I thought I have been through it all, there was a moment where I felt I was losing faith and my heart did start to harden. I felt my capacity to love has reached its point of giving. But it was not who I was. The burden of not having to love at all just made it worse for me. This last month leading up to my birthday, I have felt more rejuvenated, more alive knowing the world needs more love. I am not going to be tainted with who I was meant to be…that FREE SPIRIT loving everything and everyone. Its been a long road to find myself here just making sure everyday I am grateful to have a heart that can see beyond the capacity to just love LOVE. Today I thought would be a perfect time to begin blogging again. It has been years since I last wrote. It is my sister, Maribel’s birthday and she is years younger than I am…but I look up to her. I have traveled and met thousands of women all over the world, but I am fortunate enough to say that my sister is the most incredible, strongest woman that I know. I call her my Warrior Girl. She has been battling kidney failure for 12 years and has had many encounters of near death experiences. Especially after getting a donor 5 years ago, months later, was diagnosed with Valley Fever. For those who have met Maribel, she never plays a victim. You would never know her daily routine in fighting for her life. She constantly rises above everything that life has thrown her and has this glow of resilience that reflects her undeniable faith. Today is very special to me. With all that we have been through together. The laughter, tears, joy, fear, and just living in the unknown of a chaotic world that we live in we share a special bond because at the end of it all we both know we can only rely on FAITH. “Faith is being sure of what we hope for and certain of what we do not see.” Hebrews 11:1. When you feel you have reached the point in life where you can’t seem to see the light at the end of the tunnel. Remember there are people out there who battle far more trials than you could ever imagine. My sister has taught me to always be grateful. To always live life like it is your last. With all that she has been through, she always wears a smile on her face. You would never know that everyday she battles to just live life another day which I believe we all take for granted. This Is My Story. This Is My Destiny. The blog below, I had written almost 2 1/2 years ago and at that time I really felt my trials were over…I love that saying “God gives his hardest battles to his toughest soldiers”. Literally after sharing probably one of the most memorable moments in my life other than the day I got married and the birth of my baby girl. It was a completely different experience only because my daughter was older at that time from the first time I had brought her when she was only 3 years old, and to see her enjoy being in a very destitute place, having a servants heart, I feel the seeds were sown where this is my legacy that will follow to always serve those who are less fortunate. It was an adventure walking through monsoon rainstorm through mud and trash. Alexis was fearless. A very memorable moment that I will never forget. A couple months after this amazing moment with my family…the most unexpected trial happened where I felt my life was over. But when you go back to my very first blog, “When the caterpillar thought the world was over, it became a butterfly” The last two years proved that true love does conquer all with of course, God being front and center. I am living proof that nothing is impossible with God. When the time is right, I can’t wait to tell our testimony. It has been two years of a roller coaster ride, but it was all worth it. I feel stronger than ever! God was deep cleaning each one of us to prepare for his journey. To test if we are ready to go to next level in growing his kingdom. And we all passed…not perfect, by all means, there is still work to do. But one thing that I know for sure, we have each other’s back no matter what and our family is in tact with God’s protection over us. He showed himself and I can never deny his love for me or for my family. This is it, my time has come. Just with a press of a button, waiting patiently for God to move, to move me into his calling, his will, his path for me. I have had this vision that God has pressed upon my heart to do. And for so many years I have been given several tasks and I haven’t been able to feel it was the right time. So many trials and tribulations to overcome that it was so difficult to have the courage or confidence to even comprehend all of the things the Lord wanted me to do. Life took over but I knew God was chiseling in my flesh to bring out all of my spirit and removing my flesh to truly follow him. It took time to finally surrender everything to him. To not let life take over but to really start moving, moving fast into what he has called me to do. I ask “Why me? I am not worthy enough and I don’t know if I can do it all Lord”, than there is his voice, his gentleness starts to embrace me. I breakdown and cry like a baby. “Call to me and I will show you great and mighty things you don’t know.” Jeremiah 33:3. It was several weeks of weeping and feeling heavy, talking to my prayer warriors through all that I am feeling. I than realize my tears are cleansing my old to new. So here I am, honored to finally embark on this new chapter of my life. The chapter that I feel I have been waiting all of my life. Once afraid, full of fear, overwhelmed with the tasks called to do, I am honored Lord. I am ready. I have been on an airplane for 11 hours on my way to the Philippines where God was very clear that I was on my path 7 years ago when I first visited my country after 30 years. I was born in Quizon City, Manila and came to the United States when I was just a baby,a one year old. I knew when I finally was able to go to my native country, it will be life changing for me. I always had a desire to help the needy, especially children. I remember in my teens, I had turned on the television and watched these children in Africa suffering. I was so devastated! Since that day I have always felt a need to be there for these children. Than after hearing stories and seeing photos of children in the impoverish areas of the Philippines while growing up, yes, I was excited to visit my country and see all of its beauty, but for some reason, my desire was to go to the slums. I was riding with my Uncles who wanted to take me to do some sight seeing and they had asked me where would I want to go, I pointed than to the slums across the way. They were surprised with my request and had advised me that it is very dangerous to go there without knowing anybody who can guide us through the slums. So I had asked if they knew anybody and they said they would start asking around of who can take me there. So here comes the Lord in all his glory, as clear as day…the very next day to be exact! I was walking in the mall and two American men had approached me. Respectfully they had approached me and said a really nice compliment. I than said thank you and they realized I had no Filipino accent and that I was also an American. “Your not from here, where are you from?” asked one of the gentleman. At the time I was living in Miami, Florida and they said they were from San Francisco. “Wow! I said. “That is where I grew up!” Excited, feeling now there is a reason behind this encounter. So I asked what are they doing in the Philippines. I asked if it was for business. They said no, they were helping in a ministry with a Pastor Nixon located in Tondo, Philippines also called Smoky Mountain. So you can only imagine what I was feeling. Just yesterday my desire to go find someone to take me to the slums when driving with my uncles, God has already ordained this meeting. So we realize there approach was a God send, a calling to come up to me. It was like kindred spirits connecting, out of all places, the mall! I was beside myself of this moment to have total confirmation of where God wanted to take me to…Smokey Mountain…wow! O.K.! I couldn’t believe this just happened. Lord thank you for always showing off! I love you! They were leaving the very next day so the gentlemen who I had met were not able to take me to Smoky Mountain. I was given Pastor Nixon’s phone number and I called him right away when I returned to the hotel. I told him I was referred by a Pastor from San Francisco and his colleague. How God ordained this encounter of us meeting and it lead to him. We than scheduled to meet the following day at his church called Beautiful Temple in Tondo. I remember this day vividly. The day that will change my life forever. I truly felt God moving in my life of what he has called me to do. Lord you are so good to me! But only you truly know the desires of my heart and you have opened the flood gates to have my dreams come to a reality. During that time, I was given the book from my Aunt Erlinda, “Purpose Driven Life” by Rick Warren that I was reading with my husband Alex Arnold. On our way to Smokey Mountain I was reading to him and it had said that you are on your way to what God has destined you to do. Out of all the chapters in the book, and the pages that was needed to be read, how God orchestrated that it would be at that time in the car to hear his words so clearly of my destiny. Tears poured down my face. I was in such awe of God’s amazing love for me. I cried so hard with my husband. Embarking on this journey that we were able to share together. Nothing mattered anymore but this time with what God has called us to do. We than began to drive through the streets of Tondo. It was a very hot day in Smoky Mountain. Dirty, muggy, full of debris everywhere. I have never seen anything quite like this. Children walking freely, most with no shoes walking on the hot pavements, tattered clothing and faces full of black ashes from the remnants of the smoke. We than got to our destination Beautiful Temple. Its exterior was definitely not of what a beautiful temple in our eyes should look. It was run down and falling apart, with a lingering stench of trash mixed with the smell of smoke. But for some reason there was a overwhelming sense of peace that lingered as well. Being an interior designer, aesthetics is very important to me. But not as much as energy. Pastor Nixon and his wife, Pastor Cora had poured out so much love that it filled the room. There was a sense of contentment. It was a warehouse that was filled up with thousands of children who come to worship and honor God in spite of there circumstances. I was overwhelmed with all the children in the room. The smiles, the laughter. These children made me feel special. Some came to just hold my hand. Some came to give me big hugs. They treated me like I was somebody special. So enamored by my presence, yet I was enamored by there presence. Full of joy, peace, and lots of love. Dirty as can be, but so pure in heart and spirit. Nothing tainted in there eyes. Imagine they can only live with just loving one another. Think about it…they are all they have, each other. No distractions of the material things but a total focus of just there connection of not knowing anymore than what they have of family and the desire to just survive on a day to day basis. Living and loving one another like there may not be a tomorrow. Pastor Nixon than takes me to a small covered alley way. It was dark and aery The stench was much stronger due to how small the area was, yet there were family’s of 2, 4, 6, sometimes more, living in a one bedroom. It was a little community of its own. Some had bodyguards in front of the doorway. Can you believe stealing happens in spite of the living conditions? But $1 US dollar could feed a family. We than walked into this small room where there was a young lady who Pastor Nixon introduced me to. She than takes my hand up a ledge where we had to crawl into a small space and there was this beautiful little baby. He was very sick. For some reason, this lady thought with my hands, I can heal him. He was only 6 months old and malnourished. Oh God give me the strength to do something about this! This baby, these children, they don’t deserve to live like this! Why? I ask you Lord. Why do they have to suffer? I held this fragile baby in my arms hoping that by feeling my love he will than be healed. The young mother said she had 6 children. One of them had died and one is missing. My passion grew stronger. So much to do! Lord please give me the courage to impact this community somehow, someway. I need your guidance. You lead me here, now just tell me what you want me to do? So that day in August of 2003, exactly 7 years ago. My perspective in life completely changed. Especially having a baby of my own that was just turning three years old. I went back to our condo that we were staying at and I remember how I looked at her different. She was so beautiful. So pure and innocent. But more than anything else, blessed. I than decided that she needed to experience this city of Tondo with me and her father. We went back the following week. I was drawn to this place called Smoky Mountain. Alexis has had a very privileged life, traveling all over the world already since she was born. My husband was a jet setter and of course we were there right beside him as much as we can be. I knew that her perspective would be completely be different than mine. Such different worlds of where we were staying in the city of Manila in a beautiful condo, with a driver and Alexis having her very own nanny… to 20 minutes away, was a city so upside down with family’s that literally live in trash to make a living compare to the city that we were staying at with tall buildings and beautiful surroundings. I knew as young as Alexis was, she would be impacted. I wanted to sow those seeds within her of having a servants heart. The more God blesses us as a family, the more we have to give back. When we arrived with Alexis, she steps out of the car and says “Oh mommy it stinks!”, but than children started running to her, like they were long lost friends that they haven’t seen in awhile. She is usually very weary of being approached by children, people in general. Alexis was always very weary of people she didn’t know. I was concerned to bring her to Smoky Mountain. I thought she would not been able to handle it being there was probably close to 1000 children in one room. I had her hug children, a little afraid that she might catch some kind of disease, but God gave me the confidence that he had his protection over our family. My perspective changed with her sharing this ministry with my husband and I. People ask me how am I am able to handle being in this poverish environment. Seeing all the suffering and pain, especially with thousands of children who live in trash. I always said, it hurt, but in a good way. This was such a strong desire of mine for so long and to finally be able to give back, not even money, but my time, my presence of feeling all these children with love, it was not hard at all. But than this second time with Alexis, as I watched her interact with all of these children. She had fans already being there such a short period of time. A lot of the children were amazed by her. They knew she wasn’t from there. They would touch her curly hair like they never seen hair like that before. Not once did Alexis complain after she walked out of the car with recognizing the stench in the air. Almost like it was removed by the holy spirit. We were warned that this second time around, the children would smell even more. It was a different set of children that have homes amongst the hills of trash and smoke. It was a very strong smell that is unforgettable, but not unbearable because for some reason it would slowly go away. Than I sat there, watching these hundreds of children worship the Lord. There hands raised up high. Some reaching desparately for Gods covering. I have a picture of this young boy who’s very present, really was reaching out to God. With his eyes shut closed tightly. Praying so intensely and right beside him was this little boy watching me, smiling, like it was God telling me through him “I have these children wrapped in my arms, they feel me, they know me. Don‘t worry, I got them.” Just with that little boys smile I heard God’s voice. Than it became feeding time. This was what truly broke my heart. As soon as praise and worship was over, the children was asked to stand in two different lines. One line, boys and the other, girls. It became very intensified in the room. The boys and girls energy shifted to desperation of wanting to fill there hunger. Children started to fight in line and get more aggressive with one another. I than grabbed Alexis closer to me and ran around the corner away from the feeding area. I handed her to her nanny and started to throw up. I looked over to Alexis who was confused and out of sorts. I became protective and out of sorts myself. I broke into tears, crying intensely. I just couldn’t believe these children were fighting over two slices of bread. My Lord Jesus, help me through this journey that you called me to do. Am I really strong enough to follow your task that lies ahead of me. I felt overwhelmed at that very moment. I felt weak. When we were on our way back where we were staying from Smoky Mountain, I was concerned about what Alexis could be thinking. I know she must have been confused, full of wonder at how different these children were from her. Probably overwhelmed with that many children surrounding her and approaching her. But I watched her closely and she is so amazing, resilient. She definitely handled the situation better than I did. Then we got to our condo, her nanny was giving her a bath and shared with me that Alexis was asking if we could bring all the children from Smoky Mountain and give everyone a bath. I approached Alexis and said there are too many of them and they wont fit in the bathtub. Alexis than said “But mommy, they could stand in line and Tita Gigi could clean them all up.” innocent and pure. She really meant it too! So here I am, 7 years later. I just thought about that on the airplane and laughed to myself how God has been working on me the last 7 years. The number 7 – we come now to the great number of spiritual perfection. A number which, therefore, occupies so large a place in the works, and especially in the Word of God as being inspired by the Holy Spirit. It denotes COMPLETENESS or PERFECTION. It took 7 years for God to build the strength within me to overcome all the obstacles that came my way since I had last been here in my native country of the Philippines. So many trials and tribulations that lead me back here to find the perseverance to endure all that may come my way. There is nothing that can stop me now from doing all that God called me to do. No fear. Coincidence – no coincidence. Just total confirmation, my God kiss of how it is truly in his time not mine. Have you ever felt like you were unraveling at the seams with the past heartaches, overwhelmed with the future, and just having a hard time living for today? No matter what you do, you feel stuck and it is like a vicious cycle year after year, living the same monotenous life over and over again. I have the solution. Go away to a quiet place for a couple of days. Refresh and press your RESET BUTTON. As I have become fully focused on launching my film and making revisions on my script, digging deep into the lives of my characters, I knew the only way I was going to be able to accomplish making an empowering film, I needed to make sure I was ready to deliver a compelling film with where I was at in my life. I knew I had some loose ends that I needed to getaway to work out with God. I do feel called to send this message of unconditional love to the world. So I asked God “Why Me” and have made excuses for many years now to not do the assignment he has asked me to do. Distractions, life takes over. Than all of a sudden, you wake up one morning, and basically raise up that white flag, “O.K. God, I surrender everything to you. Now what do you want me to do?” So I went away for 3 days to a very profound place called New Camaldoli Hermitage in Big Sur, California. A private retreat that invites complete silence and reflective solitude located off Highway One. The drive there was breathtaking! I had loads of God kisses along the way! The property is situated in the inspiring and rugged central coastal mountains overlooking the Pacific Ocean. Located on its own eight hundred acres at an elevation of thirteen hundred feet, it had a view of both ocean and woods. My safe haven was one of the newest additions to the property nestled privately in the woods. I have always stayed at 4 to 5 star hotels, so this was very humbling. But to be completely honest, so much more nicer because the energy of this little bungalow was very serene. I thought I would be afraid in the evening because you could hear the restling in the woods, but no fear. It felt odd at first because I am tucked away, literally by myself. But I really felt God’s presence and slept like a baby. Especially no television, no phones, no internet access, complete contemplative silence. Even when meeting others who are here (all 10 people), as well as the Monks that reside here, it would be just an exchange of a smile or a very quiet “hi.” Three days with digging deep into my soul with only God and me. Rolling up my sleeves and studying, meditating, seeking, reading, writing, walking in all of his beauty. And all I got say…AMAZING! Complete paradise with no noises from this world we live in. If you do feel stuck, broken, and want to truly hear from heaven above, go away by yourself. Be alone where there are no distractions. Here is a link to a place I highly recommend. I finally got to know God here www.contemplation.com. I will have several blogs of my favorite God moment images, sharing my spiritual experiences throughout the week. I have had major breakthroughs that I wouldn’t of experienced without spending this time alone with God. I can only hope I will be a vessel to you or people you know that are going through trials. They are not alone. I am inspired to lead people into knowing that God is REAL. All he wants to do is love you but the world with all its NOISE, distractions, we become confused not living our best. Keeping us so far away from what he wants us to hear. Do you want the flood gates to finally open up in your life? Well it is time to restore and replenish, press your RESET BUTTON…living a NEW LIFE this coming New Year! Are you a caterpillar or a butterfly today? Or maybe something in between? This is a saying that resonates deeply within me. It perfectly illustrates the journey I’ve embarked on. I’ve been blessed over the years to be a wife, mother, and owner of my own interior design company, MALAYA. I feel God nudging me to accomplish what He began in me a year ago, to finish writing my first screen play. The genesis was a poem I wrote, inspired during a time of distress and fervent prayer, and today has emerged as an empowering feature film. My faith has gone through great trial and tribulation, but praise God that my set-back became my come back! Welcome to my first official BLOG! I invite you to do life with me & I pray that I can inspire you to be a beautiful warrior, a LUMINOUS WARRIOR!! 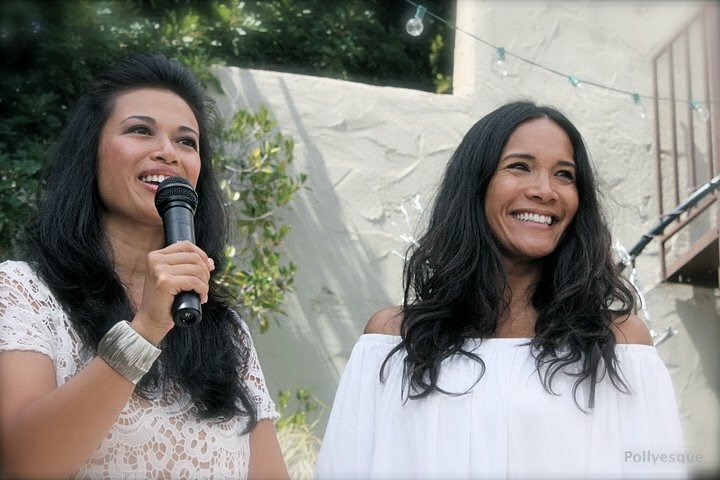 This is Rowena Rodriguez, one of my best friends at a ministry event I hosted in my home for Plain Jane Project – a purity ministry she founded. She’s one of those friends that never fails to speak life into you, even if it means shaking you by your shoulders! You have one of those in your life right? If you don’t, get one today!! She’s the one who gave me the title “Chief Visionary Officer.” It’s so amazing to see yourself through the eyes of those who love you. Often they have a vision of you that is greater than your own. They speak of you in such a manner, that you think “Wow! I want to like that!” And then you realize, it’s you they’re talking about! It’s both endearing and sobering. I wanted to make this one of my first posts because it was her God given gifts, as well as her vision for my life that challenged me to think & Dream Bigger! GOD used her to turn the key that unlocked HIS plan for my life. In one lovely afternoon brunch, I vomited all my dreams, plans, & aspirations over a couple of lattes; and Rowena literally mapped it out, gave me a course of action, and laid before me.. My very own LIFE MAP!! Imagine having writers block and being paralyzed by life’s challenges, then in one fell swoop your eyes are opened & you can see clear into your future, a future that’s filled with hope & joy!! First off you need God, & the gift of His son JESUS. Then you need friends who love you, that speak life into you, & keep you accountable. Friends that won’t allow you to shrink back, but to grow, live, and live abundantly!! ACCOUNTABILITY is so.. so.. so.. important to have. I’m grateful that GOD has surrounded me with angels. Psalm 91, says that GOD gives His angels charge over you to keep you in all your ways. I pray that you see & feel your angels encamped around you today! !